The history of still life painting begun in the Dutch Golden Age takes a seriously weird turn here as both flowers, vase and background are taken over the top in hue and texture. Since a floral arrangement in a vase was allowed to be the sole subject of a painting at the turn of the 17th century, both scientifically showing off the diversity of nature’s bounty and prosaically immortalizing it as a symbol of wealth and power, this genre has endured in many iterations across the movements and centuries. 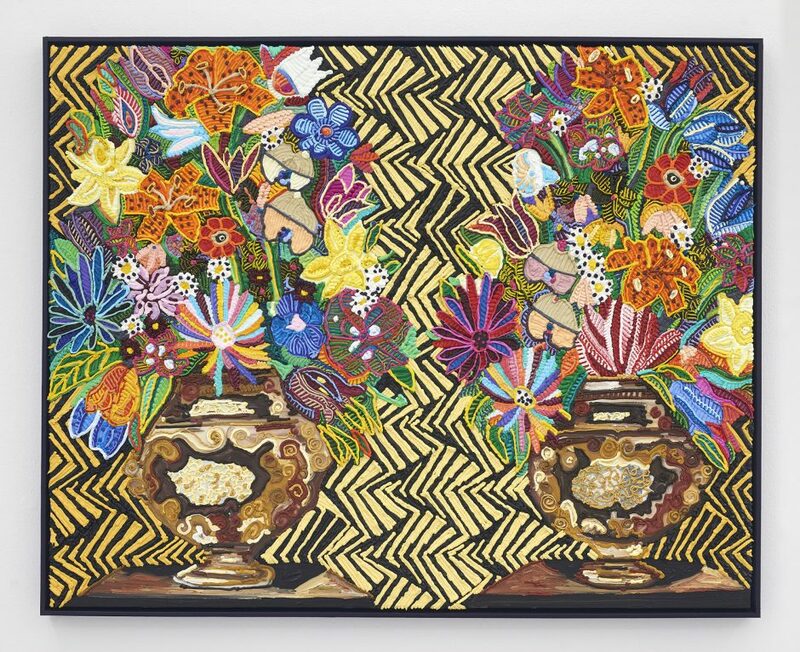 Here in 2019 Larsen uses Art Deco and Rococo Revival-era vases to present impossibly colorful and thick flower arrangements against optically scintillating backgrounds. The vases in these paintings go back to a Qing-era Chinese enamel vase to Rococo revival styles of porcelain mid 19th century, though the majority of the vases are from Longwy, France during the Art Deco period. The very round boule vases for example are from this faiencerie, whose overglaze enamel decoration became world famous in 1925 during the International Exhibition of Modern Decorative and Industrial Arts where the term “Art Deco” was coined. Similar to cloisonné, these vases lend themselves to Larsen’s stained-glass style of discrete color zones piled high with pigment. Overflowing each vase are beautifully impossible-colored tiger lilies, leopard spotted pansies, parti-colored zinnias, neon edged leaves and purple polka dotted tulips. In terms of painting technique, here we find Larsen (already a weaver of oil paint) climbing higher to even thicker and more gravity-defying piles of paint. Using bags of oil paint with icing nibs, she squirts and squeezes the paint into confectionary piles, frosting the panel with tubular and Spiro-form extrusions. In this show she experiments with depth by adding both scraped away areas and inches-thick piles of paint; the chunkiest monkey she started in May adding layer after layer over months as it dried. 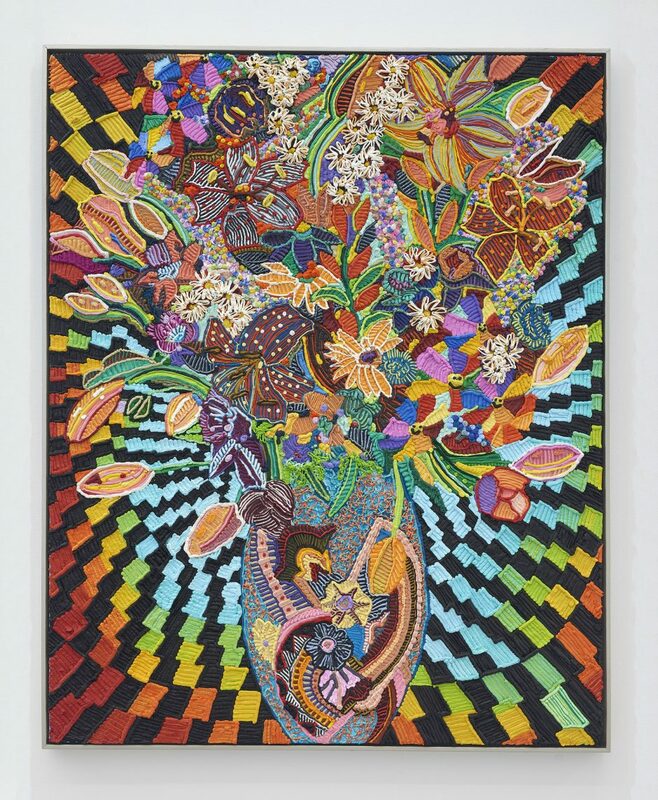 Also debuting here are silly-string spritzes and plumply pipetted linework not seen previously in her oeuvre.